I'm not very good at cardmaking, I tend to stick to easy rather than get myself in a flutter. I decided traditional Red and Green with a hint of Tartan for friends and neighbours this year. 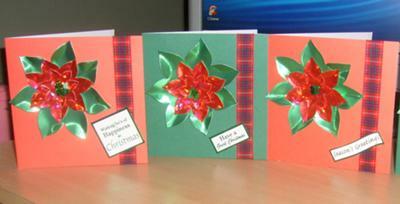 I used the Spellbinder Poinsettia dies with Mirri card, then shaped each of the leaves to give some dimension. Then using Pinflair Glue I assembled all the flowers and finally added some sead beads or sequins to the top layer. I let the flowers dry off overnight, before attaching to cards. 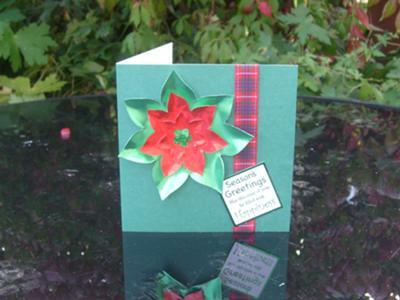 I used 5x5 inch base card in Red and Green, and decided to use a 1 inch Tartan ribbon in toning colours wrapped around the right side of card. I put a Poinsttia on the top left and to finish a foiled sentiment. The inside will be finished with vellum and a printed verse. Christimas is always a busy time for cardmaking and the sooner you start the better, especially if you have lots to make. These cards in traditional colours would look beautiful gracing any mantle shelf and they are lovely. I would be very pleased to recieve a card as lovely as these Linda and so will your fiends. Never under estimate your own sklls as a card maker ... and we all need to stop being our own critics. Listen to what others say about the designs you make and take the praise graciously, then get busy and make even more and your confidence will grow with each card you make. i you are very good at card making.Look at those cards,they are neat and well designed.They look very beautiful to me. I think they look really professional. they are lovely. Thank you all for a much needed confidance boost, I find it extremely difficult to like my own work. Don't put yourself down because these cards are just lovely. I sometimes go over the top when trying to design and you have shown me that one flower and some ribbon can make a card. Well done, and keep up the good work. Your cards are lovely Linda, keep on keeping on. Who wouldn't enjoy receiving your card. Linda,your cards are vibrant. They will light up any home at Christmas. Love your cards. Sometimes simple is best. They are perfect. Thank you very much for your lovely comments, you have made my day !!! Love these cards,don't sell yourself short,anyone would be pleased to get one of these!